The United States and the Soviet Union both launched space exploration programs in 1955. The Soviet program quickly took the lead, achieving each milestone at least a year before the United States. The Soviets were the first to launch a man-made object (Sputnik, 1957) and a man (1961) into full orbit. For Americans, Sputnik was more than a satellite. It was a threat to our national security and a constant reminder of Russia's technological superiority. In 1958, President Eisenhower responded to this threat by forming the National Aeronautics & Space Administration. NASA took control of America's space program and put it on the fast track to success. After launching an array of research and spy satellites, NASA turned its attention to creating a manned spaceflight program. Between 1961 and 1963, six astronauts participated in orbital and sub-orbital flights as part of Project Mercury. The Mercury program sent the first Americans into space: Alan Shepherd on a sub-orbital flight in 1961, and John Glenn in full orbit in 1962. In 1961, President Kennedy set his sights on the ultimate goal...putting a man on the moon. The project had two phases: Project Gemini would develop the technology necessary to live and work in space, and Project Apollo would coordinate the actual moon missions. A target date of 1970 was established. In the Gemini program, ten orbital flights taught astronauts to maneuver their spacecraft and conduct spacewalks. Project Apollo launched 23 test missions and one manned mission before sending a crew into lunar orbit in 1968. This crew sent back a stunning photograph of the Earth rising over the lunar surface. 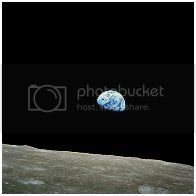 Earthrise became one of the most famous images in history. In 1969, Apollo 11 landed on the moon. We had achieved our goal a year ahead of schedule, and we had done it first. Five additional moon landings followed between 1969 and 1972. In 1960, America was still racially segregated, especially in the south. Many people chose to fight discrimination with non-violent tactics such as boycotts, sit-ins, marches and rallies. Martin Luther King Jr. was an inspirational advocate for non-violence. Unfortunately, peaceful protests and gatherings were often met with unspeakable violence. Change was slow in coming, and radical groups like the Black Panthers were formed. These groups used violence to bring about social change. The assassination of Martin Luther King Jr. galvanized the movement. Lunch Counter Sit-Ins: In 1960, black and white students in 54 cities occupied whites-only lunch counters until store owners were forced to integrate them. Freedom Riders: In 1961, members of this group went on the road to fight segregation at bus terminals and on interstate bus lines. 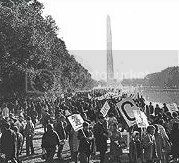 1963 March On Washington: 200,000 people gathered at the Lincoln Memorial to hear speeches and to rally for equality. ----• "I Have A Dream"
1963 March In Birmingham: This non-violent campaign was led by black students of all ages. The tactic created widespread support for the cause and negative publicity for the city when the students were attacked and arrested. Freedom Summer: Young people traveled throughout the south in 1964, holding rallies and registering black voters. 1965 Selma March: Martin Luther King Jr. led thousands of protesters on a march from Selma, Alabama to the state capitol to campaign for black voting rights. Birmingham Church Bombing: In 1963, four black girls aged 11 to 14 were killed when a bomb was tossed into their church basement. Murder In The Deep South: In 1964, three civil rights workers were murdered while participating in Freedom Summer as members of the Congress Of Racial Equality. 1965 Watts Riots: In Los Angeles, the arrest of a black motorist escalated into a six-day riot in which 34 people were killed. Assassination Of Martin Luther King Jr.: In 1968, the charismatic civil rights leader was shot and killed outside his Memphis motel room. Student Nonviolent Coordinating Committee: This group was formed in 1960 to organize local lunch counter sit-ins. They also assisted with the 1963 March On Washington. Congress Of Racial Equality: Formed in 1942, this group played a large part in organizing civil rights activities. Black Panther Party: This militant group was formed in 1966 by Huey Newton and Bobby Seale. Members favored using violence to bring about social change. Nation Of Islam: Also known as the Black Muslims, this group was formed in 1930 to provide spiritual and economic support to African Americans. Members rejected Christianity and racial integration in favor of black self-reliance and the teachings of Allah. Malcolm X rose to prominence as a charismatic leader of this group. On November 22, 1963, President Kennedy was killed by an assassin while riding in a Dallas motorcade. For many people, this event was a turning point. The "Camelot" years of the 1950s and early 1960s were over, and the turmoil of the late 1960s was just beginning. According to the Warren Commission, Lee Harvey Oswald was the sole assassin. Over the years, this has proved to be a very controversial finding. Two things are certain, however: everyone remembers where they were when they heard the news, and the photo of little John-John bravely saluting his father's coffin is probably one of the saddest images we'll see for a long time. Senator Robert Kennedy entered the 1968 Presidential race and quickly became the Democratic party's top candidate. After winning the California Primary, he was shot while walking through the kitchen of the Ambassador Hotel in Los Angeles. He died the following day. In the 1940s and 1950s, Vietnam was a French colony torn apart by the threat of communism. Ho Chi Minh's communist guerillas, known as the Viet Minh, were rapidly gaining power in the northern half. In the south, America provided aid to the French government in the form of military advisors. By 1961, the French had been ousted, the Geneva Accords had divided the country into North and South Vietnam, and the Viet Minh had a new name: the Viet Cong ("Vietnamese communists"). There were approximately 700 American military advisors in South Vietnam, which was ruled by the oppressive and dictatorial regime of Ngo Dinh Diem. In 1963, President Diem was overthrown and assassinated. The strength of the Viet Cong and the instability of the South Vietnam government caused the conflict to escalate. There were no American combat troops present in Vietnam at this point. Despite government assurance that none of our boys would die for a foreign war, the number of advisors in South Vietnam continued to increase. In 1964, there were 23,000 advisors training South Vietnamese soldiers and assisting them with their missions. The turning point came in 1964, when the American warship USS Maddox was fired on by the Viet Cong in the Gulf of Tonkin. President Johnson was given permission to stop the conflict "by any means necessary." He responded by ordering the bombing of North Vietnam. 85 percent of all Americans approved of his actions. In 1965, the first U.S. combat troops arrived in South Vietnam. Over the next two years, the number of troops deployed rose from 185,000 to 400,000. Unlike conventional wars, taking land was not a goal in Vietnam...killing the enemy was. Sadly, this resulted in many civilian deaths, and it was this fact that began to sway public opinion against the war and against the soldiers fighting in it. In 1968, up to 500 South Vietnamese civilians were killed when a search-and-destroy mission went terribly wrong. The members of Charlie Company, led by Lt. William Calley, participated in the brutal slaying of the My Lai villagers, and the subsequent cover-up caused a scandal. At his trial, Calley was portrayed as a good boy who had been turned into a murderer by the military. He was sentenced to life in prison, but this decision was later overturned. By 1969, the number of U.S. troops in Vietnam topped 600,000. The American death toll that year reached 34,000. The Viet Cong proved to be a formidable enemy: they transported supplies and men along the Ho Chi Minh Trail, disappeared effortlessly into the jungle foliage, and disregarded a holiday cease-fire when they launched the surprise Tet Offensive. Although casualties increased, very little progress was made on either side. After taking office in 1969, President Nixon began to pull troops out of Vietnam. Henry Kissinger met with Vietnamese leaders in Paris to launch peace negotiations. The numbers were promising....by 1971, only 156,800 troops remained. By 1972, only 16,000 advisors were left. In 1973, a treaty was signed, the draft came to an end and the first POWs were released. Despite the treaty, fighting continued for two more years. The war officially ended when the Viet Cong invaded Saigon in 1975. American advisors and South Vietnamese citizens were evacuated out of the city by helicopter. It was all over, and communism had won. In 1972, actress Jane Fonda made a trip to North Vietnam, where she spouted pro-communist slogans, had her photo taken behind enemy lines and recorded propaganda messages for the Viet Cong. Even today, the hatred that was felt for her has yet to be dispelled. "You know, we only went into Vietnam as advisors. Last week, we dropped over 40,000 tons of advice." Back home, an anti-war sentiment was taking over. Young people burned their draft cards and protested against the war. Returning vets were pelted with rocks and insults. The winner of the 1968 Presidential election would be the candidate who could make the most convincing anti-war promises. Over 2,000 soldiers were still unaccounted for when the Vietnam war ended. Three decades later, that number was still over 1,800. These men fall into two categories: POW (Prisoner Of War) and MIA (Missing In Action). In the 1960s, young people were willing to fight for causes they believed in. They rejected the conservative attitudes of the 1950s and challenged the status quo. Worthy causes during this decade included civil rights, equality for women, preserving the environment and peace between nations. In 1968, the modern Women's Liberation Movement was born when approximately 100 women gathered to protest outside the Miss America Pageant. College students held anti-war rallies, formed student organizations and protested against outdated and unfair school policies. Above all, they fought for the right to assemble and speak their minds. At Berkeley, the 1964 Free Speech Movement was a turning point in their crusade for the right to join political causes. Students For A Democratic Society was a nationwide student activist organization formed at the University of Michigan in 1960. By 1968, there were over 250 chapters at campuses all across the country. While students and hippies held peaceful demonstrations, groups like the Black Panthers, the Yippies and the Weather Underground had a radical and sometimes violent approach to bringing about social change. More than anything, students and young adults were opposed to America's participation in the Vietnam war. Anti-war rallies and demonstrations were held all across the country, especially on college campuses. Rather than fight in a war they did not believe in, many men of military age burned their draft cards or moved to Canada to evade the draft. 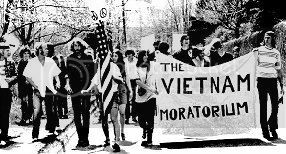 The nation celebrated National Vietnam Moratorium Day on October 15, 1969. All across the country, in the largest cities and the smallest towns, people gathered to hear speakers and to protest the war. In many areas, colleges cancelled classes and businesses closed for the day. These events were followed a month later by a large rally in Washington D.C. that attracted nearly half a million people. Together, these events sent a message that politicians couldn't ignore. Protesting the war was no longer strictly an activity for radical hippies. Middle America had taken up the cause. Our universities are "circus tents or psychiatric centers for overpriveledged, underdisciplined, irresponsible children of well-to-do blase permissivists." In the 1960s, clubs frequented by gay patrons were raided on a regular basis. In June 1969, a routine raid of the Stonewall Inn in Greenwich Village resulted in several days of rioting. This event united gay activists and eventually gave birth to the modern gay rights movement. During the 1964 election campaign, the Great Society was President Johnson's idealistic vision for America. Sweeping reforms on all levels, from civil rights to a "war on poverty," would make the United States a great society, indeed.